The MixWizard4 12:2 from Allen & Heath is a versatile, all-purpose professional mixing console with 100mm faders. The console features 8 mic/line inputs with inserts and direct outputs, six auxiliary outputs, two full channel dual stereo inputs, two stereo returns and two built-in FX engines with 20 presets. Channels 1 through 8 feature mic/line inputs with balanced XLR and TRS jacks with 48V phantom power for plugging in microphones and instruments, each with a 4-band EQ with sweepable mids. They each also feature a peak indicator, -20dB pad, six aux send knobs, pan knob, channel mute and a high-pass filter that attenuates frequencies below 80Hz by 12dB per octave. 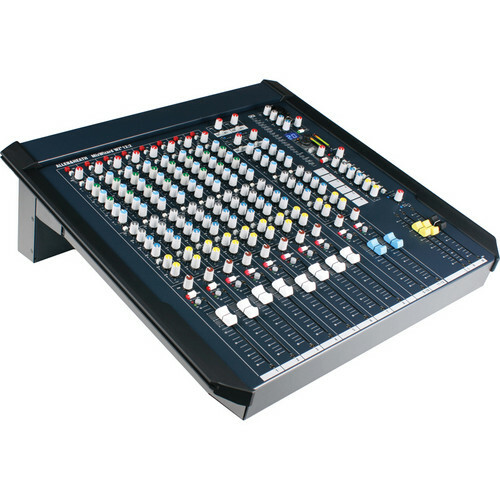 The mixer also includes two channels with dual stereo inputs that can be used separately, mixed together, or split and routed so that one feeds the other. Channels 1 through 8 also feature inserts that can be used for inserting processing equipment into the signal chain such as compressors, outboard EQ and delay units. Furthermore, they each have direct outputs that can be sent to a multi-track hardware recorder or computer audio interface for tracking live performances. The console's six aux sends use balanced TRS output jacks that can be used to feed stage monitors, outboard effects and other gear. In addition, the MixWizard4 12:2 is equipped with two stereo returns with TRS inputs that feature separate gain knobs. These allow for returns from outboard effects or input from external audio devices such as CD or MP3 players to be mixed to the stereo bus. Box Dimensions (LxWxH) 24.5 x 23.0 x 13.5"